Not sure if you have the latest updates for Windows 10 or Office installed? 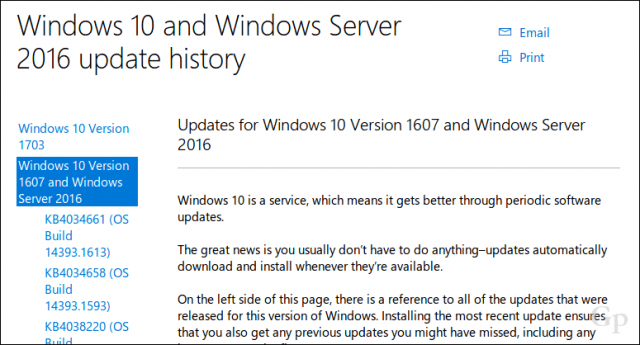 Find out using the Windows Update History and Office 365 What’s New web pages. In the era of software as a service, apps and operating systems are constantly changing. Two perfect examples are Microsoft’s Windows 10 and Office 365 productivity suite. Whether it’s a feature, quality or cumulative update, it can become hard to keep up with what’s new or changed. Microsoft is continually revamping its update mechanisms, too; introducing new terminologies such as Current, Deferred and Long Term Service Channel. So, how do you tell what’s installed or updated or the latest? 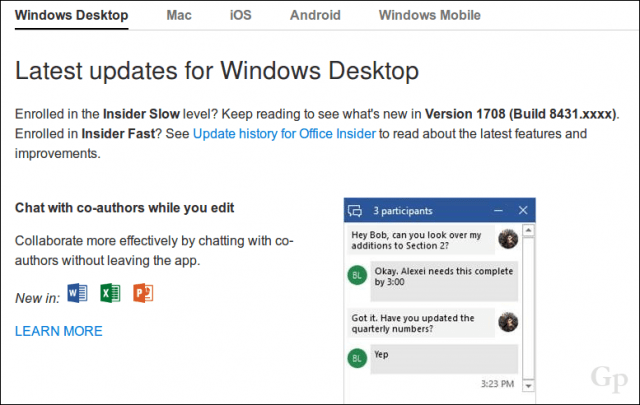 The software firms change log services Windows Update History and What’s New in Office 365 web pages can help you get up to speed with all the updates and new features. Let’s take a look at what’s on each page. 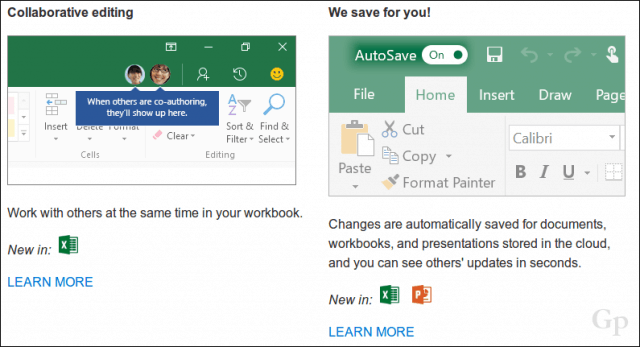 Microsoft maintains a change log web page where Office 365 subscribers can find out about the latest version, changes, and features included in apps such as Word, Excel, and PowerPoint. Changes introduced in Office 365 are covered up to September 2016. Separate tabs help you filter by platform too, so, if you want to know what’s in the latest version of Office for Mac, iOS or Android, you can click a tab to find out. We previously covered how to switch from a Deferred to Current channel release in Office 365 for Business. Users will notice that Microsoft is using a similar versioning to Windows 10 for Microsoft Office. This is identified by the year and month. The current version as of this writing is 1707 (2017, July). Starting in the fall, both Office 365 and Windows 10 will release major updates, followed by another release in the spring. 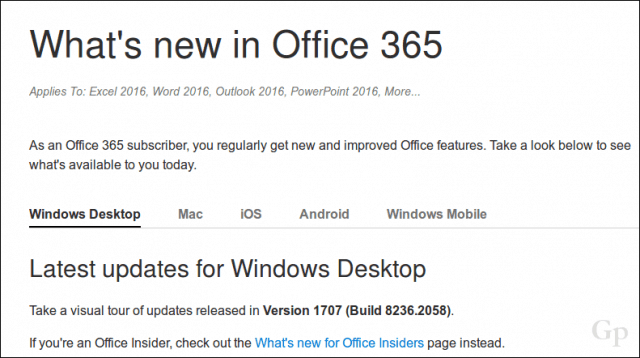 The What’s New page also keeps a change log of features for Office Insider releases along with perpetual licenses. Perpetual Office licenses do not get new features like Office 365 subscribers, so, you won’t see major additions. 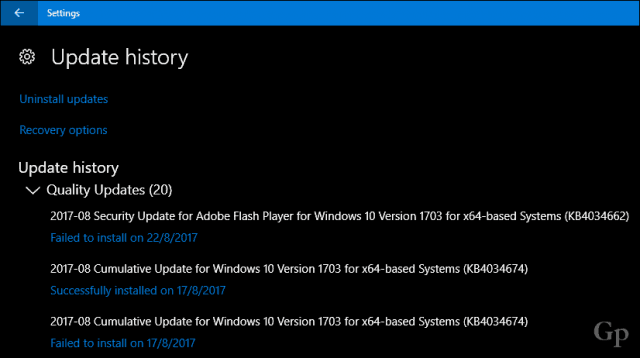 Windows 10 currently keeps a history of successful or failed updates. You can find it by opening Start > Settings > Update & security > Windows Update > Update History. However, it’s not obvious whether or not the latest cumulative update is installed from this page. This is where the Windows Update History web page can be handy. Users can review a chronology of updates released for both client and server versions since 2015. 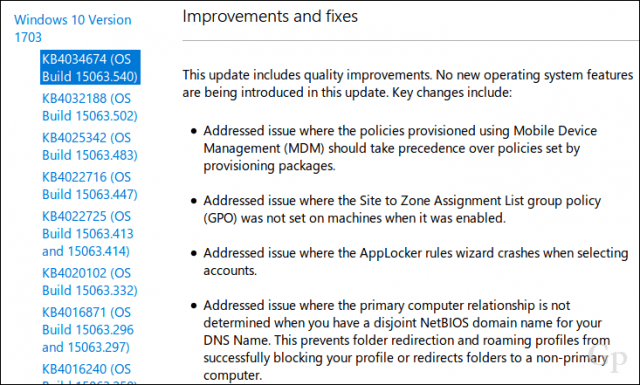 Direct download links to the Microsoft Update Catalog for each update are also available. This makes it convenient for users who might be on slow connections or experiencing difficulty downloading through Windows Update. Using both the Windows Update History and What’s New in Office 365 pages, users can verify if they are up to date easily. I personally find it handy to keep up to date on the new features so I can take advantage of them immediately in my workflow. Let us know if you find these services helpful. We are also interested in knowing whether you are an Office 365 Subscriber, Insider or just a regular Office 2016 perpetual user. Fantastic. Don’t use Windows Office, but recently I couldn’t install any updates. They kept failing but I didn’t know if I had the most current version of Windows 10. Finally figured out that I didn’t and ended up reinstalling my Windows 10 and updates worked. The above-mentioned page would have been such a big help. I’ve bookmarked it for future reference if needed. Andre, I love how on top of things you always are and appreciate your information and advice. Thank you.! Thanks for your informative tips, Andre! When reading your article, I am not quite sure whether I have the latest Windows 10 version installed. I’m using Office 365, am caught up with all Windows 10 updates, but when checking under System > About, Windows 10, version 1607, Build 14393.1593, is listed. Should my system by now have version 1707 installed?